This is a 35 question movie guide of the box office hit, The Post. It stars Tom Hanks and Meryl Streep. 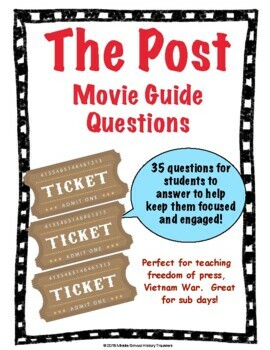 These 35 questions go along with the movie, so this will help students be engaged in the movie and help them focus on key themes that are happening in the movie. Great for sub! Also great when teaching about Freedom of Press or the Vietnam War. No prep needed for teachers. Just print and ready to go!